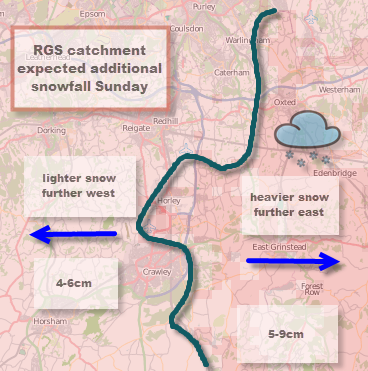 Update Sunday: 5cm of fresh snowfall in Reigate on top of the snow on Friday. Main roads round Reigate remain clear but freezing temperatures expected overnight (possibly down to -6°C) could create problems for journeys tomorrow morning. RGS parents and students please refer to HM message on the school website ; RGS staff please refer to emails. More details on weather outlook later. Two LOW pressure systems will do a strange spinning dance around the South East on Sunday and Monday, depositing more snow and maybe some icey rain. This unusual pirouette of storms starts on Sunday with a LOW moving North out of France and skirting the East coast and then curving north west across the country. This will bring cold Easterly and Northerly winds to Reigate and up to 5cm more snow starting late morning (actually started 8am: moved much quicker than expected: snow front moving 30mph+ 😉 !) with moderate falls after lunch, dying out in the evening. Reigate is on the edge of heavier snowfalls which will affect Kent, where 10cm is possible over the hills. Skies will clear overnight and temperatures could drop to -6°C. Monday sees the next LOW, tracking up the English Channel from the West, with a risk that it will bring snow or icey rain to Reigate in the afternoon. The exact track of this little LOW remains uncertain: the UK Met Office suggest it will track into Belgium (and we will miss any snow attached) but other models (NAE & ECMWF) suggest it will come much closer to the South East which would bring more snow: uncertain – so watch for updates! Every wind direction will be represented during the next two days: the coldest directions from the East and North will dominate but occasionally warmer wind directions from the South and West will cut into this weather dance lifting Reigate above freezing, but not for long. Whilst more weather systems early this week will approach from the west, usually a warmer direction, these LOWS will mostly track south of the UK and this will drag in cool winds from the east and north. The jet stream remains south of the UK and until it shifts north we will be stuck in cool Polar air. Nevertheless, temperatures in Reigate should creep above freezing during the day this week, bringing a slow thaw. Advanced charts show a vigorous LOW pressure arriving next weekend which could drive in proper mild Atlantic air: probably a return to rain and wind.